EBL uses a proprietary machining process to frabricate tubes. 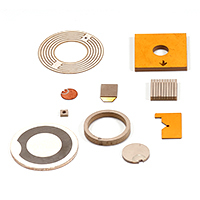 Starting with fired ceramic, we machine, length grind, electrode, and polarize each tube to exacting tolerances. 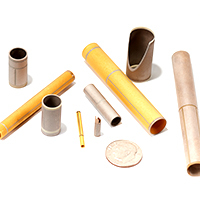 Although machining is more costly than extruding, pressing, or other bulk processing methods, only machined tubes like ours can meet the stringent requirements of wall thickness uniformity, straightness, and concentricity for all precision applications. Moreover we will machine to virtually any geometry, which you require. EBL's tube actuators are available with four different electrode types, electroless nickel, our most popular electrode, gives a superior combination of thinness, uniformity, durability, corrosion resistance, and adhesion. The addition of a thin layer of gold over electroless nickel improves solderability and conductivity. 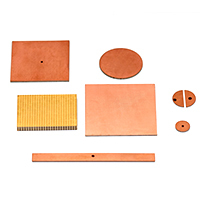 Electroless copper is recommended for high magnetic field environments. Fired silver gives good conductivity and is nonmagnetic. 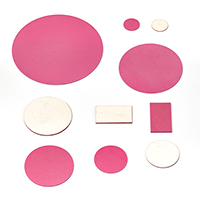 Compared with electroless nickel, however, fired silver has a number of significant drawbacks: greater electrode thickness, greater thickness variability, and the mechanical distortion the tubes can undergo, when exposed to the high temperatures required for the silver firing process.